Our Sun – the centre of our solar system. The Sun is a star (informally known as a yellow dwarf) that is located at the centre of our solar system. By the standards of other stars, it is not necessarily very big but when compared with the size of the Earth it is huge – you could fit 1 million Earths in the Sun! The Sun is almost entirely spherical and is mainly made up of ionized gas mainly hydrogen with the remainder mostly helium. The Sun is the closest star to the Earth and it is what helps to support life on the Earth (and possibly in the solar system). The many interactions between the Sun and the Earth are what drive the seasons, the ocean tides, the climate and weather systems. Many cultures and civilisations have come to worship the Sun and have created calendars based on the movements of the Sun. Cultures such as the Egyptians, Aztecs, native Indians and Chinese built monuments and created mythology based on the importance of the Sun. Each different culture knows the Sun by a different name, the ancient Greeks called it Helios and the ancient Romans called it Sol which was then translated into the word “sun” that is used in the modern western English language. Without the Sun there would be no life on Earth. Read on for more interesting facts about the Sun. The Sun was formed 4.57 billion years ago. The Sun has a diameter of 1,392,000 km. This diameter is 109 times the diameter of our Earth. The sun with a ‘superprominence’. The mass of the Sun is huge at approximately 330,000 times that of Earth. This means that the Sun’s mass contributes to 99.86% of the total mass of the entire solar system. The Sun is the closest star to the Earth at 149.60 million km away. The Sun is made up of six distinct regions – the core, the radiative zone, and the convective zone are located in the interior; the surface of the Sun (the photosphere); the chromosphere; and the outermost region called the corona. 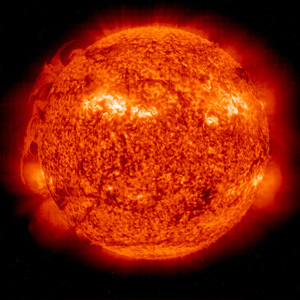 The temperature of the core of the Sun is 15 million degrees Celsius and this is hot enough for nuclear fusion to take place. 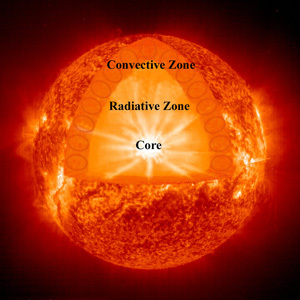 The core is what powers the Sun and is what created the heat and light that we get on the Earth. Sunspots are areas on the photosphere of the Sun that are darker in colour than the areas that surround them. They are very strong magnetic fields that increase and decrease in number every 11 years based on the magnetic cycle of the Sun. This cycle also controls solar flares coming from the Sun. 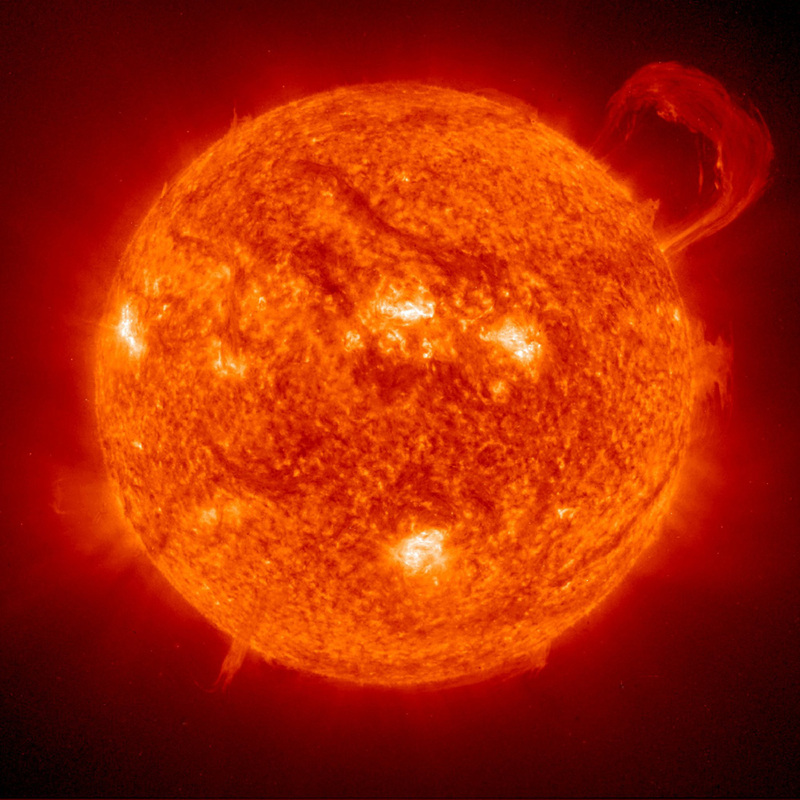 The temperature on the surface of the Sun (the photosphere) is 5,500 degrees Celsius. Although the Sun is a relatively large star, there are stars that we have discovered that are so large that they would almost reach Saturn is they were placed inside our solar system. Scientists believe that in 5 billion years time the Sun will enter a red giant phase which will mean that it will swell up to consume the inner planets in the solar system (the Earth included) and eventually turn into a white dwarf. The Sun is slowly heating up over time. Every billion years it is believed that the Sun’s luminosity will increase by 10%, so in a billion years time the Sun will be giving off so much heat that liquid water on the Earth will not exist and therefore life on Earth as we know it will no longer exist. If you take all of the stars within the 50 nearest stellar systems within 17 light years from the Earth, our sun is the 4th largest in mass. The largest is a star called Proxima Centauri which is 4.2 light years away. The Sun orbits the Milky Way once every 225-250 million years. Light travels from the Sun to the Earth in 8 minutes and 19 seconds. The brightness (luminosity) output from the Sun is enough to power a million, million, million, million 100 watt light bulbs.